Now, with the addition of new gems, I find the build to be viable but not comfortably viable for endgame content. If it has one thing going for it, the build is downright cheap in it's end game form as every piece of gear is easy to craft and/or cheap to get. Why Slayer and Spectral Throw? The main reason is it's leech potential with Vaal Pact as it's combination with Brutal fervour and Endless Hunger make for quite a tanky character with very little investment in term of points. As the build requires projectile damage, projectile speed, attack speed, sword, 2h and crit nodes you are going to build you way to Vaal Pact. The fact that on the other 4 points you can get Onslaught, OP culling, 50% reduction of reflect phys damage and more damage are just icing on the cake. Maligaro's Virtuosity would be a big upgrade in dps, but only temporary as Winds of Change is a required part of the build. I recommend picking up and equiping Spectral Throw as it's rewarded to you, the reasoning is to get used to the mechanic of the projectiles, with 2 Steel Spirit jewels, you need to get used to lining up your targets to get as many hits as possible. With 2 Steel Spirits each projectile is going to deal 10% additional damage per target hit, mechanic that helps this build considerably. LMP, Faster Attacks and Faster projectiles are must haves for leveling before you get Winds of Change, Ancient gauntlets, after getting your gauntlets drop faster projectiles and equip Brutality or Physical projectile attack damage. 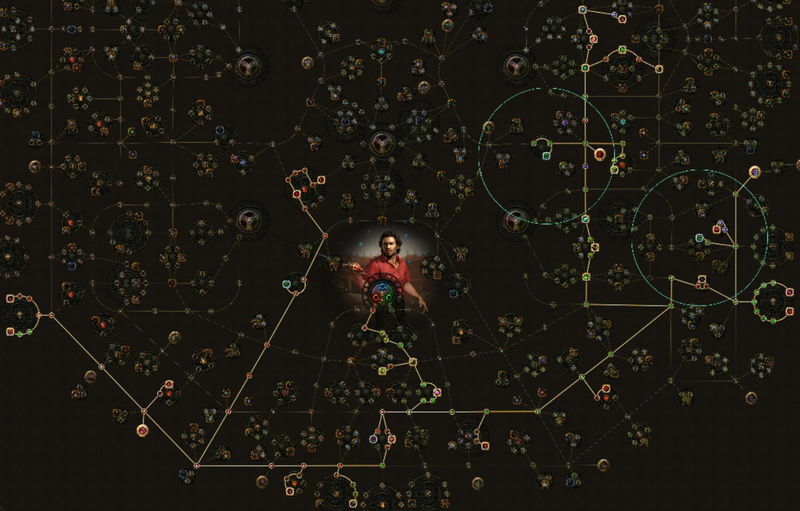 Also, focus first on the duelist side of the tree to get Iron Grip ASAP, with this all the strength you got from nodes in the area actually does something for you apart from a little health. - 4 points to get Destroyer. 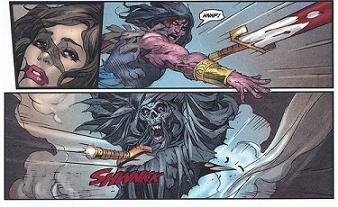 - 3 points to get Executioner. - 1 point for the Life and Mana leech in the Leech wheel. Only remove this point if you have another mana leech source OR if you have Hiltless and mana isn't a problem any longer. For single target damage swap GMP for Physical projectile attack damage. Projectile Weakness gives a large enough DPS increase that the additional leeching from Warlord's Mark can't beat the leeching that PW gives you with it's bigger DPS. Also, Blasphemy works really well with Slayer, as the Ascendancy point Headsman gives you 15% increased AOE of area skills if you have killed recently. Also, Blasphemy is the reason why you want Hiltless as a weapon for mid to late mapping, because with Blood Magic you can add Increased AOE to Projectile Weakness, which would bring your mana reservation close to 90%. Using Blasphemy and Haste isn't viable with any other weapon unless you have an Essence Worm or a good Unset ring. 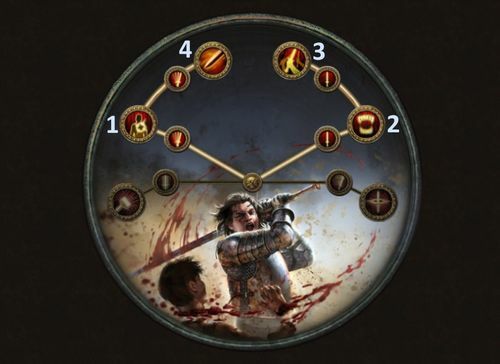 Ancestral Warchief isn't an option as it buffs melee damage, which does nothing for this build, so the additional attack speed and Maim support (for additional Phys damage on Maimed targets) that comes with AP is a good fallback. With Onslaught, several points on attack speed and 3 Frenzy charges from Blood Rage, this character will move quickly, so using Fortify with Leap Slam is a good combination for the Phys damage reduction that it brings, you just need to remember to keep leaping around. Obviously Terminus Est for the Frenzy charges on critical strikes and Hiltless for it's Blood Magic support enabling Blasphemy with increase AOE. With at least 40 Dexterity in Radius, each Spectral Throw Projectile gains 5% increased Damage each time it Hits. This is a DPS increase that can't be calculated, as it depends on the enemies your projectiles hit. 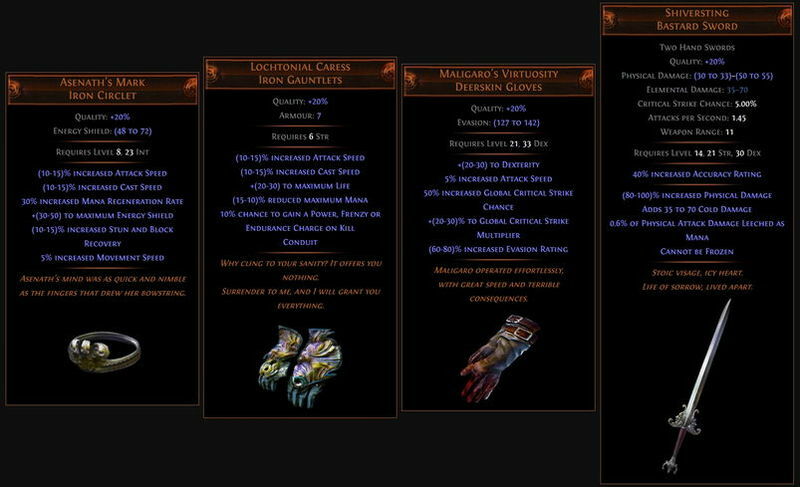 Winds of Change, Ancient gauntlets: Proj damage and speed, knockback chance and life (small). Starkonja's Head, Silken Hood: Damage reduction and additional evasion rating at low life, attack speed, global crit chance and life. Lion's Roar, Granite flask: Armor, Knockback and flee chance. The Overflowing Chalice, Sulphur flask: MOAR dps. As this build is going to travel from Duelist to Shadow, you're going to pass right through the Flash Freeze and Winter Spirit wheel, close to the Primeval Force wheel and to other additional Elemental damage nodes, so making the change to elemental is more than viable. Changing Haste to Hatred on Essence Worm. Using Ice Bite and Added cold damage in the Spectral Throw setup. Changing Winds of Change, Ancient gauntlets to Hrimburn, Goathide gloves for additional cold damage and conversion from phys to cold. And using Herald of ice or Herald of Thunder instead of Vaal Haste. http://exilestats.com/ex/ - Approximate currency exchange rate. http://www.poebuilder.com/ - Advanced skill tree builder. But I can already tell you that with Haste, Ancestral Protector, Vaal Haste and Blood Rage, the benefit you get from Frenzy charges is underwhelming to say the least, so I'm dropping every charge and I'm focusing on sword and double hand nodes and that's a big increase in dps. That also means that Terminus Est isn't the best option for the build, as Kondo's Pride and Starforge are by far the better weapons for it. I'm also playing around with support gems, currently I'm leveling faster projectiles, slower projectiles, point blank and damage on full life to find the best combination for Spectral Throw. I'm also dropping Essence Worm, as I have enough mana leech to make Haste and Blasphemy with Inc AOE work without needing to use a Blood Magic gem. And so far, that's what I can say, I'll update the build in the future with the finalized skill tree and tested gems. Are you still going crit? I like that idea. Although I'm not sure how consistent the leech will be with Kondo Pride. - As soon as I get Winds of Change, I'm swapping Faster projectiles support for slower projs. And I'll keep lvling faster projectiles as my single target swap for GMP. The additional range is good for bosses. - Without Essence Worm, Haste and Blasphemy can create heavy mana problems against rich crowds, so I'm changing the main weapon to Hiltless. DPS is slightly lower, but it's the cheapest 2 handed weapon (you can get it 4-linked for 1C), has Blood Magic support and with +2 weapon range the hitbox of the ST projs is going to be massively improved (weapon range increases the size of projectiles). - Instead of Essence Worm I'll get a socketed ring for haste with defensive rolls. BTW, going crit isn't that effective with Phys damage, it's better to go with a combination of phys, bleed and crit damage. If you go elemental (cold) with Herald of Ice, then crit becomes your go to and getting power charges is a must. What bandits do you get with this build? There's only one bandit quest and I took Alira (crit, resistances and mana regen). Updated, added Leveling guide, bandits and updated tree. Will try to record and upload videos when I get to the build ceiling. Nice guide, will try later u post some videos, ty. 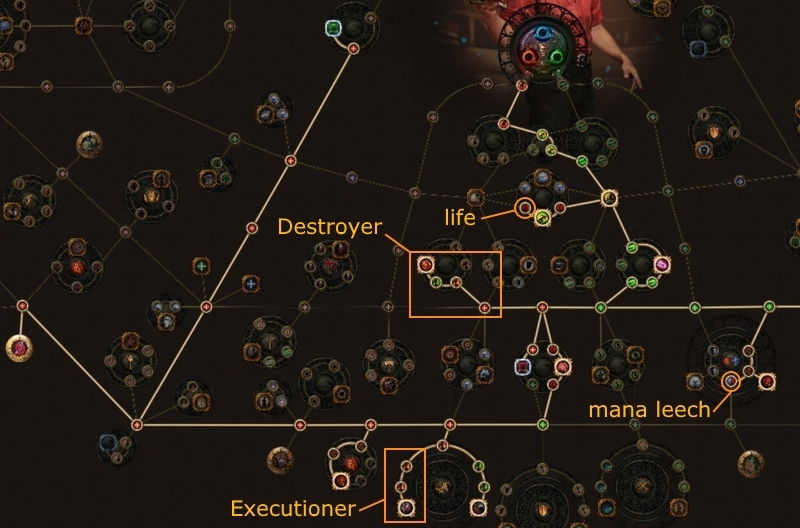 More updates, some pathing changes in the skill tree because I was derping and overall guide improvements in the leveling section and the Spectral Throw setup. There's a lot more dps now and it's quite tanky, with the leeching added to you health it tops above total 8k life. One thing to notice, though, Damage on full life still isn't supported by Path of Building, but it's working in game. Currently doing Tier 6-7 maps without hiccups and with a far from finalized version, still need a 6L Hiltless (for ST) and a 5L strength based armor (for ancestral prot. ).